Happy New Year! While Mindy and Nasser review all the nominations for the 2016 Founders’ Choice Awards, we’ll kick off the New Year with a fun new challenge. Must feature imagery which is dance related. Any form of dance, any living creature dancing, sentimental or humorous – all are accepted – as long as dance is an obvious visual theme. Must be approved for one of the listed categories below. Blank verse will not be considered for entry in this challenge. How to Enter: Post the PID (card number) and the URL (public storefront link – please WAIT for the card to be available in the public marketplace, please DO NOT post a link to your Manage Cards area) as a post in the challenge blog. We’ll forward your entry to the jury. Only ONE card per artist per challenge. Submissions must be NEW, no existing designs. Your entry must meet the Challenge Requirements and Theme or it will not be included in the challenge. Stock Card Creations entries will not be accepted. Your designs should differ from those already offered in the categories above to offer shoppers a variety of choices, not more of the same. How well the card meets the Challenge Requirements and Theme. How well the card speaks to the Category the artist chooses for the card submission. The winning designer’s card and store will be featured on the GCU Public Blog – the blog which customers view and follow. As well as featured on the GCU Public Facebook Page – nearly 38,000 followers, now THAT’S exposure! The winning card will be Design of the Day following the announcement of the winners (within 48-hours). EXCEPTION: Horizontal (landscape) cards may not be featured as DOD due to GCU Home Page space restrictions. In these cases, GCU will choose a different vertically oriented card from your store to feature as DOD. Thank you for your understanding and apologies for this limitation. The winning card will be added to the Greeting Card Universe Design Challenge Winners Pinterest Board – currently GCU’s Pinterest Page followers: 2K! The winning card, should the artist choose, may be referenced in a new series by the winning artist and he/she may Fast Track all cards in the new series (being sure to give the Challenge URL and winning card PID in your Notes to Reviewer for each card in this series). Winning card will be included in a marketing email to over 100,000 customers! NEW starting this month, GCU will create a Meet the Team board for the winning artist under the Pinterest GCU account where the winning artist will be able to pin and promote her own storefront and all that makes them a unique card designer and one of GCU’s artistic community team member. Winning card will be posted on GCU’s Instagram with 2,000 followers and counting! Your submission will be Design of the Day the following week of announcing the Challenge winners (within 7-days). 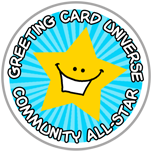 Your card will be added to the Greeting Card Universe Design Challenge Winners Pinterest Board. Check out these tips, tricks, freebies, and tutorials from our own GCU Community Blog which might be helpful in this month’s Challenge. Be inspired to create and learn something new! Wishing everybody a wonderful 2017, filled with lots of creativity and lots of peaceful moments. Happy New Year, Barbara! Entry received, good luck! Happy New Year to everyone! Here is my entry for the January challenge. Happy New Year, Liz! Entry received, good luck! Hi Julia! Entry received. Glad to have you join us in the New Year, good luck! Hello, Laurie! Happy New Year to you as well! Entry received, good luck. Hi Doreen, here’s my entry for the contest. Thank you! Hi Cathie! Entry received, good luck! Hello Doreen, here is my entry for the challenge. Happy New Year, Betsy! Entry received, good luck! Hi Michelle, Happy New Year to you as well! Entry received, good luck!